With family or friends, for business, a seminar or a tasty meal, we welcome you to our friendly and relaxing hotel. The popular restaurant, garden and new fitness room will ensure you have an excellent stay. 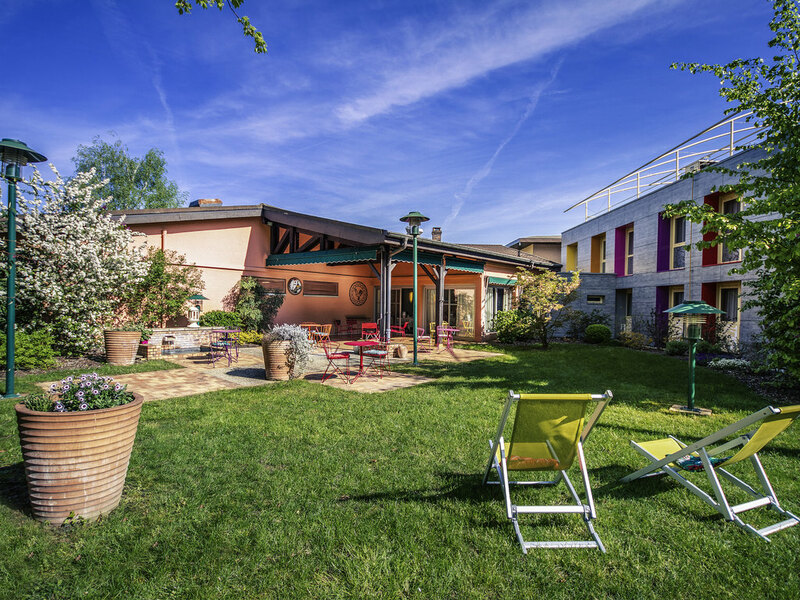 Stop off at the Mercure Bourg-en-Bresse hotel! Easy access from the A40 highway, large free car park, charging point for electric cars. On your way to Italy, a ski trip or a walking holiday, choose one of our 60 bright rooms with modern decor. Take advant age of our fitness center and then unwind on our restaurant terrace and enjoy the specialties created by the chef. Book your seminar here, we offer all the comfort for a successful stay. During your business or family trip, enjoy a visit to the Royal de Brou Monastery, a real jewel of Gothic art, the old quarters of the city with its half-timbered houses. An address combining heritage and leisure. Our air-conditioned, carefully renovated rooms accommodate up to four people (2 adults and 2 children). You have all the comfort you need for a truly enjoyable stay.